Cross-post: End of the Nightmayor? The following is cross-post from Harry’s Place, written by Dickie Perrett (I have verified who it is). You may recall after Labour narrowly lost the Spitalfields and Banglatown by-election a fortnight ago I offered some advice; fortunately they seem to have largely heeded this advice and won! Weavers ward is distinctive but pretty reflective of Tower Hamlets as a whole. It’s classic inner city stuff. It contains about 50% social houing, including the Boundary Estate (the first municpal social housing in Europe) and contains an example of social housing from every decade from the 1890s to the 2010s. It has a significant Bangladeshi and Somali population, but is not dominated by Bengali polictics like some wards. It includes Columbia Road flower market, and the surrounding Jesus Green estate (where small 2 bedroom cottages fetch £750k), but is also one the most deprived wards in England. There are four gay or gay friendly pubs, a Conran restaurant and hotel, and numerous coffee bars. It’s part of Bethnal Green, but estate agents now call it Shoreditch! It also contains Bethnal Green Academy (Formerly Bethnal Green Technology Colege)– one of the fastest improving schools in England, and second most improved in London – which became an academy in Janauary against the opposition of the Labour Group and Lutfur Rahman (in a rare show of unity). Only problem was, the chair of Governors was also Chair of Tower Hamlets Labour party, but chose to stand down from the latter role amongst much public criticism. Throughout the 80s, 90s and 00s, Weavers ward had been a Liberal/Lib Dem stronghold albeit with a weird interlude where the Liberals stood candidates against each other – Tower Hamlets politics has always been a bit odd. In 2002 and 2006 the Lib Dems got their act together and won all three seats, but are now relegated to fifth place behind the Greens. The Tories didn’t even bother running a full slate until 2006. But there was a certain element of deja-vu to having a by-election on GLA election day, as this happened four years agao when one of the Lib Dems stood down. Labour ran and won with Fazlul Haque, unfortunately they never asked Fazlul to prove where he lived and it turned out not to be in Tower Hamlets. Fazlul was subsequently deselected and stood for Respect in the 2010 all-out election and lost. In 2010 not only did Labour regain Bethnal Green and Bow from Respect (with Abjol Miah replacing George Galloway) and retaining Poplar and Limehouse – with an increased majority (against George Galloway), but, with a superb machine campaign operation, had its best result on the council for a generation increasing from a majority of one in 2006, to a majority of 31. Following the election of Lutfur Rahman as the independent Mayor (having been expelled from Labour) later that year, a number of councillors defected to form an independent group. All of these candidates were imposed by the London Regional office of the Labour Party, the same clowns that were responsible for the rushed selection of Ken Livingstone (not to be confused with the clowns that ran his campaign). But this included taking all seats in the Weavers ward for Labour for the first time in twelve years. The three candidates, Anna – a nurse at the local hospital, Abdul – a veteran local community worker and Kabir – who worked in the local police station supporting drug users worked hard as a team to build up the Labour vote. Last year, Kabir took the decision to work in an unpaid role supporting Mayor Rahman and was suspended from the Labour group (as he was openly campaigning for the opposition in this campaign, his formal expulsion will be imminent.) There’s also a lot of doubt about how much time Kabir spends at his flat in Bethnal Green! Due to the cuts in the health service, Anna had to take a job outside of London and resigned her seat causing this by-election. No doubt the level of abuse she faced for raising the fact that people in the public gallery at council meetings were making homophobic remarks towards Tory leader Peter Golds will haved weighed on her mind as well. John has never stood before, but does live locally and he’d recently led a local campaign to save a local one-stop shop / housing office from closure, and got Mayor Rahman to turn around his decision. Abjol doesn’t really have a local connection. John was an excellent candidate and had an excellent campign team around him. He campaigned on local issues and spoke to hundreds of residents from al backgrounds. His campaign team came from every sector of the community. He didn’t waste time talking to village elders. It was basically a Labour machine campaign. And this is how all significant wins in Tower Hamlets have been achieved. As I’ve said before, leave the communalism to Respect. Spent there time whining about Tower Hamlets Labour Party doing nothing for Ken and focusing all of there effort on Weavers. Well, after the way Ken treated Tower Hamlets Labour Party, who could blame them? Except it was nonsense, whatever officers of the party felt, they held their noses and campaigned for Ken. There had been regular campaigning for the last few months and there was door-knocking in every ward in Tower Hamlets on Thursday. Although Abjol stood as the Respect candidate, none of his campaign literature mentioned this. I understand he asked the Returning Officer to change his nomination papers after they had been submitted. I spotted one very confused looking Trot on Thursday wearing a Respect rosette, looking fruitlessly for some comrades. They also tried to ape Labour’s campaign techniques. Issuing dirtect mail on very local issues, but in one case, covered here by Ted Jeory’s excellent blog they seem to be breaking all manner of rules. Also the direct mail came from Mayor Rahman, not from the candidate – without giving away too many campiagn secrets – you’ve rather missed the point. Here’s a picture of the rat run that is the Jesus Green estate. 20 mph zone and road humps in space. And not a single moving car. They – and by they I mean the IFE backed supporters of Respect and Lutfur Rahman – simply have no idea how to campaign outside of the most deprived densely Bangladeshi parts of the borough like Spitalfields and Whitechapel. They tried to copy Labour, but simply don’t have a clue. Like the far left, it suits them to keep people in the ghetto. Labour politics from left to right share one thing – a belief in social justice and social mobility, that’s why we’ll always win. Eventually! Tories – keep an eye on them. 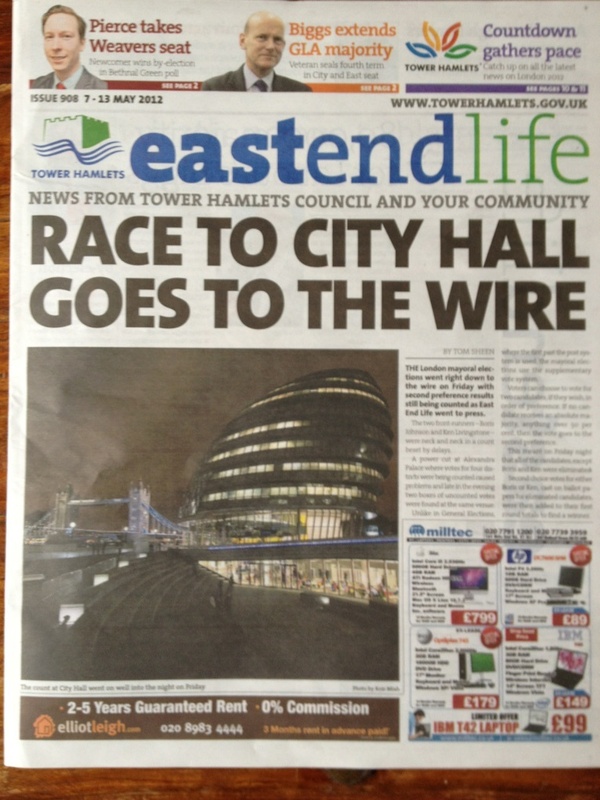 My views on East End Life are well known to regular readers of this blog, although they’ve softened recently since sometimes it seems to be the only paper covering Tower Hamlets. However, the splash in the latest edition, which has just dropped through my letter box, sums up everything that’s wrong with it. THE London mayoral elections went right down to the wire on Friday with second preference results still being counted as East End Life went to press. The two front-runners–Boris Johnson and Ken Livingstone–were neck and neck in a count beset by delays. [etc etc]. ie pointless bordering on the absurd. We all know the result (it came through on Friday night) and for those readers who were waiting on tenterhooks for the council paper to arrive today, they’re still none the wiser. I wonder if they’ll splash on Boris’s victory in next week’s edition. The paper’s editor is Laraine Clay, an experienced journalist who surely would have known how ridiculous it was to have devoted page 1 to a non-story would have been out of date by today. In any case, the council paper is meant to be there to inform residents about events in our borough. And therein lies the problem, I suspect. I’d be amazed if the hands of Lutfur, and/or Takki Sulaiman, and/or Murziline Parchment were not involved in the City Hall Goes To The Wire splash. Methinks they got just a little bit too over-excited as Ken’s team did better than expected on Friday. The strap-line under the paper’s masthead says, “News from tower Hamlets Council and your community.” I think Ken’s groupies forgot to read it.